Resync of files for 1.15e. Updated Ula Class to remove active sonar based on input from an Ula Submariner. Thanks LCDR for your contrinued help on the Ula. Note: The game didn't like just setting ActiveSonarModel=FALSE to accomplish this (probably because the HUD has a hardcoded button for active mode) so I had to get a little creative. It appears to be working. Let me know if any issues occur. Fixed a couple of ship name typos in 2004 Russian campaign. This may have been the cause of the blank mission screens in the campaign. Akula II and Sierra II submarines should propery display now in the signatures panel in the campaign as well. Added the OHIO SSGN back into the 2004 Campaign as a playable sub. Added UK and Norwegian Subs to playable subs in Quick Missions 2004 option. Updated Ula Class with Harpoon, TASM, and TLAM capability based on input from an Ula Submariner. It also makes Ula able to complete the TLAM Mission in the Campaign, so BONUS! to the Quick Mission Selections. All 2004 Campaign NATO and Russian Units now usable in the Quick Mission Editor. Corrected issue causing YASEN CLASS props to not rotate. More work on the ULA model based on information from someone who served aboard the class. Replaced the SEAWOLF and VIRGINIA Models with the official SEAWOLF model released by Killerfish Games in 1.12. Replaced the LOS ANGELES Flt II and LOS ANGELES Flt III models with he official models released by Killerfish Games in 1.12. Reworked ULA and HAUK Models. Cleanup of general campaign files, and general 1.15 sync. 2004 Campaigns for NATO and Russia sync'ed for 1.09e. NOTE: When installing this mod, you must do a clean install to guarantee it will work. If you merge the mod with other mods, I cannot guarantee it will work. If you already have an override folder, I suggest you rename it as override_hold, and then install the override folder for this mod as detailed below. If after installing this way, the mod will not work, then it is probably necessary to uninstall COLD WATERS, and then reinstall it before installing this Mod. This will ensure a clean install. Copy the override folder into StreamingAssets. You will have the original game default folder, plus the new override folder when complete. The Mod will modify the campaign list to add the new campaign, the 2 default campaigns will still be playable and the 2004 Campaign will not overwrite any of the existing campaigns data. 2004 Campaigns for NATO and Russia sync'ed for COLD WATERS 1.09e. Hot Fix for Seawolf model due to minor changes in the Narwhal base model in 1.08c. I had to uninstall and reinstall COLD WATERS, update to Beta 1.08c, then add the 2004 Mod to get everything working correctly. Fixes for more model changes in the base models in 1.08c. I had to uninstall and reinstall COLD WATERS, update to Beta 1.08c, then add the 2004 Mod to get everything working correctly. Fixes for changed propeller size on Seawolf and Virginia, other Model fixes for changes in the base models, and a fix for the missing usn_mk45_description in 1.08b. Sync weapons, sensors, aircraft, vessel, and dictionary files for changes in 1.08. Hot Fix for typos in mission files. These may be the cause the intermittent game freeze during a mission or after completing a mission. One was in SSBN_PATROL_1 of the Russian Campaign, and may also account for the reported issue with the SSBN Patrol mission not ending correctly. Fix for the intermittent game freeze during a mission or after completing a mission. Took a while to duplicate, but hopefully this is corrected now. Further improvements to the models in the mod. Tweaked and refined Pump Jets on several sub models. Finished the Modelling of the Nimitz Class CVN in the Russian Campaign, so now the Carrier looks more like an American CVN. It's a little clunky, but for now it'll have to do. Made the OHIO-class SSGN Refit playable in the 2004 NATO Campaign, per player requests. Several mission and ship descriptions corrected for spelling and clarity. Hot Fix to resolve an intermittent crash when attempting to classify SIERRA II in the Campaign. Thanks to ChaosphereIX for reporting this. Added USS VIRGINIA-class SSN 774. While only USS Virginia was in commission in 2004, in the interest of playability, I have made all of the Block I SSN-774 available in the 2004 Campaign. I have to thank Goldfish716 for coming up with his Pump Jet technique. It vastly improves the look of VIRGINIA and SEAWOLF (as well as other subs in the mod)! Tubes 7 & 8 should now be working properly on Seawolf, Akula, and Sierra. Thanks to KILLERFISH GAMES for the fix on that. Added the UUM-125A Sea Lance to the 2004 Campaigns. While cancelled in reality, in the conjectural WWIII of COLD WATERS, it has been highly requested in the Mod. Thanks to LeopardDriver, The Bandit, and ETR2(SS) here on SUBSIM.COM for supplying the information that got this working completely! Added the Royal Navy to the 2004 NATO Campaign. Swiftsure=class SSN, Trafalgar-class SSN, Upholder-class SS are playable. Based out of Holy Loch/Falsane. Updated SSN 21 Seawolf model to add the Pump Jet using Goldfish716's Technique. Thanks again to him for coming up with the technique, and for designing the spreadsheet that make implementing this a breeze. Added a new RUSSIAN 2004 Campaign that exists alongside the the original campaigns, and the 2004 NATO Campaign. Same back story as 2004 Campaign, but played from Russian POV. Akula I, Akula II, Sierra I, Sierra II, Victor III, Victor II, Alpha class SSN's and Kilo, Tango class SS are Playable. Home Port is Murmansk, and Opponents are US, UK, and Norwegian Vessels and Submarines (modified from the Russian Surface Ships and Subs, since we can't access the models, but with modifications made using existing components). All Modded Subs and Ships should now properly display damage when hit by weapons. This Mod Update has been tested/synced with the 1.07c Beta Update. Please report any glitches encountered. Land War updated to match the Campaign Backstory. Extensive changes to the Campaign Map. All mission orders/events should now refer to Russia/Russian Federation instead of Soviets/Warsaw Pact. Adjusted some mission's number of enemy vessels since there are more capable units in 2004. Still issues with the Tube 7&8 reloads, but we will have to wait for Killerfish Games to address that. I left Tubes 7&8 active on SSN-21. This Campaign is now relatively finished. I will attempt to address any issues reported, and I will keep it in sync with any patches released. Next up, I'm going to attempt a 2004 Russian Campaign using the knowledge I've gained creating this. "Number of functional torpedo tubes no longer limited to 6"
That means I've added Tubes 7 & 8 to the Seawolf for the 2004 Campaign. and have uploaded the newest update to the 2004 Campaign MOD. I also am using this update to improve the "look" of the Seawolf in the MOD. Seawolf has a Sail forward and stubbier appearance as she is wider than the LA and shorter as well. Because of this I've changed to using the Narwhal as the base model since it has a Sail Forward design as well. I also turned off the TB-16 Towed Array/support tube graphic and the WLR-9 on the model to gice her cleaner lines. Let me know what you think. I've also squashed a few bugs that Jive Turkey has hit in his live streams (I think.) Files should now be completely in sync with 1.05b. I believe the "Flying Dutchman" Ship was caused because my campaign was written during the 1.03 - 1.04 time frame and a couple of files were out of sync. I have not been able to replicate the Flying Sub. Weapons.txt being synced to 1.05b for example seems to have resolved a couple of glitches I had noticed. An example is you should no longer see a black screen behind the Kotlin Class in the Unit Reference. Syncing weapons.txt to 1.05b resolved that issue. Mod Update # 1: Thanks to Smokeykane's post on the Quick and Dirty 688(i), I have used his technique to remove the sailplanes from the SSN-21 and SSN-751 Flt III models sail and put bow planes on both subs. It's not perfect because the sailplane fairings are still present on the 3D Model, but it's a good fix until Killerfish releases actual Seawolf and LA fLT III models. A big thanks to Smokeykane for the tip! - All new 2004 campaign that exists alongside the original campaigns. - Playable Seawolf (SSN-21), Los Angeles Flt II, and Los Angeles Flt III Class Submarines. Sorry folks, I had to use the existing LA model as there is no way to currently add new models (per Killerfish Games). I did create a new Damage Control Tab for Seawolf and the LA Flt III, so you'll see the correct sub silhouettes there. Seawolf only has 6 Torpedo Tubes. While I can set the files for 8 Tubes, and they will correctly display as two sets of 4, tubes 7 & 8 will not fire. I am still working on this, but it may be "hard coded" since the Skipjack Class only has 6 Tubes in game. Still working to see if I can figure this out. - Added the BQQ-10 Hull Sonar, TB-23 Towed Array, and TB-29 Towed Array in Sensors.txt. - Added Mk. 48 ADCAP to Weapons.txt. ADCAP is default Torpedo for SSN-21 and LA Flt II/III. Mk. 48 ADCAP is Swim Out enabled on SSN-21, so no launch transient. - Added the Russian Akula and Sierra II Class Subs as AI opponent vessels, so you will have more capable opponents. Again, as there is no way to currently add new models (per Killerfish Games), so I used the Victor III as the Akula model, and the Sierra model for the Sierra II. 03-31-2018 at 02:10 PM very difficult all about it. But the campaign works? 07-07-2017 at 03:02 PM Thanks for the report on the reload display issue. I can verify that on my PC as well. I am not sure if that is something I can fix, or if KILLERFISH will need to correct it. I can fire all 8 tubes and reload all 8 tubes but tubes 7 & 8 do NOT display the selected weapon when you reload them. I will post this in the COLD WATERS MOD Folder area, and continue to see if I can fix it. Since there are no relooad parms in the .TXT files, we may need to wait for KILLERFISH to correct this. I will do what I can in the meantime. I am not ready to even consider merging this with other mods. This is a fairly sizable mod and I want to make it as stable as possible before even attempting to merge. There are a lot of things I want to ensure are stable before having to worry about which MOD is potentially causing any reported issue. Washabi202 - I am feeling your pain on this. Unfortunately, I don't see anything wrong with your basic set up for the MOD. Does the override folder contents match this"
07-07-2017 at 07:16 AM Awesome campaign btw. I think in your file SHIP_RESUPPLY_0 the phrase "Further orders to be transmitted on this downlink." is redundant. It is being produced by the game anyway, so it shows off twice at the end. 10-18-2018 at 08:56 AM can you give me a files with a wp_ss-n-7_description.txt,wp_ss-n-15_description.txt, usn_sh-2f_description.txt, usn_cg_belknap.txt? 07-03-2017 at 04:28 AM Really awesome campaign! You clearly put some effort into the storyline. Story, artwork and photos are well choosen and work very well! Also, I like that you didn`t change the system too much. I still like to keep my original 688i and the Seawolf I made, though. It also is a bit more realistic (I think), which means things like even more quiet, a bit more nimble and I tried to model the fact that it is still quiet at 20 knots. Also I recommend using only 6 tubes as 8 do not work, make up with a short reload time instead. 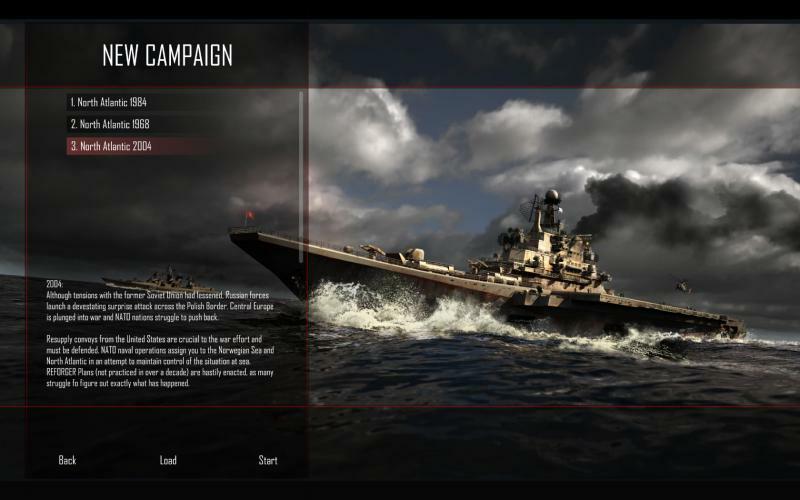 Well, I see myself playing this campaign a lot with my Seawolf and the 688s, even the standard one, maybe even with my German Type 212A, which actually was put into service around that date. One this is, I suggest you scratch some of the earlier subs like the Charlies, at least the 1 and 2. I believe the last one of those were decommissioned and srcapped in the year 1992. That is a quick one to do. Last thing for now is, that on the map Russia already has invaded middle and even western Germany, but I guess that might be a hard thing to change. Keep up the good work, it is a great campaign! 07-03-2017 at 01:52 PM Thanks to all who have downloaded my 2004 Campaign! I have just added an update. Mod Update: Thanks to Smokeykane's post on the Quick and Dirty 688(i), I have used his technique to remove the sailplanes from the SSN-21 and SSN-751 Flt III models sail and put bow planes on both subs. It's not perfect because the sailplane fairings are still present on the 3D Model, but it's a good fix until Killerfish releases actual Seawolf and LA fLT III models. A big thanks to Smokeykane for the tip! And a "Thank You!" to LeopardDriver as well for the kind comments! What settings have you used for theCavitationParameters= values? Neither is working exactly as I wanted. As I remember the formula is 1st number*<speed> + 2nd number. The result is the depth at wich the cavitation starts at <speed>. But it only means the sub can move faster at higher altitudes. The problem is, that the sonar will still fade. 07-03-2017 at 08:26 PM Does anyone else have trouble with overriding files with other mods, I am on mac and the merge folders option is really weird. I'm not on mac but I did have a big problem with getting rid of a mod and trying to replace it with another one. Turns out that for me (windows 10) there was a dedicated process (igfxEM.exe) running on my CPU for every file in the StreamingAssets folder. Hard killed all of those one by one and then I could mess around with the folders as normal. No idea if that's the case on mac though. 07-04-2017 at 10:56 AM @vla bush -- Sorry, I am not a Mac User so not able to answer your question. @walshabi202 -- Are you running any other mods? If so when you loaded this mod, did you disable the other mod, and then add the 2004 Campaign? Or did you merge the 2004 files with the other mod? Unfortunately it is difficult to run multiple mods. I usually rename the override folder for the other mod, then install the new one. For example, if I want to run the Playable Russian Mod, I will rename my override folder to overide_2004_Campaign, then I create a new overide folder add copy the Russian Mod intro it. When I want to go back to the 2004 Campaign, I rename the override folder to override_Russian_Subs and rename override_2004 to override. That has been the only way I have been able to run different mods. Hope this helps. 07-04-2017 at 11:13 AM Here is an example of my setup when running the 2004 Campaign. I have the Russian Subs Mod override folder rename, so the game only sees the override folder that has the 2004 Mod. 07-04-2017 at 11:28 AM Sorry for the typos above. Sometimes my fingers are faster than my brain. 07-04-2017 at 09:44 PM What happens when you delete the "override" folder in the C:\Program Files (x86)\Steam\steamapps\common\Cold Waters\ColdWaters_Data\StreamingAssets\ folder? So that only the "default" folder is left? Does that restore the vanilla basic game? Not sure what is going on here. But I would try completely removing the "override" folder and ensuring that the basic game will run. 07-05-2017 at 04:46 AM yes basically with every new mod revision or patch, best to delete the override folder, run vanilla, then re-copy the override folder in. That has fixed the glitches I have experienced. 07-05-2017 at 02:40 PM Is it ready for JSGME? 07-06-2017 at 12:31 AM @washabi202 -- Have you actually removed COLD WATERS and Reinstalled? I am wondering if you had previously loaded a MOD that somehow updated the default folder or something? Can you post a picture of your StreamingAssets folders content? @ YoYo -- I am not familiar with this What is JSGME? 07-06-2017 at 09:03 PM @Berserker - he can only work with the models that are already in the game. That is why the Seawolf is a LA class with the dive planes moved. He cant do much more than that. If not, is it possible to give us a quick pointer on what files we need to edit to get a sub transferred from one mod to the next? Thanks for the hard work, great campaign.